Peter Bukowski talks about some of the more memorable moments in NFL Draft history. I've always found the draft to be fascinating, so I'm looking forward to it next week. Hit the jump for some pictures of model Galinka Mirgaeva. The spring evaluation period has begun, so it's open season on high school recruits once again. We should see some more offers going out soon, including to 2015 quarterbacks as Michigan tries to fill the most important position on the field for the upcoming class. Players will be listed in order of being the most recent addition, so new additions will be placed at the top of each cycle's list. Offered players are noted with an asterisk. Hit the jump for 2016 and 2017 recruits. This has nothing to do with Michigan, but Frank Caliendo's Jon Gruden impression is his best. If I close my eyes, I can't hear the difference between the two. This is Joe Barksdale. Notice that the maize isn't quite maize enough and the blue is more of a purple. Scoop: Sagesse played in six games as a true freshman in 2007 but didn't accrue any statistics. As a sophomore in 2008, Sagesse made 3 tackles as a backup defensive tackle, mostly in goal-line situations. Then in 2009 he made 8 tackles and 2 tackles for loss in a backup role. He made 5 tackles and 1 tackle for loss as a senior in 2010. He went undrafted by the NFL in the 2011 NFL Draft but was picked in the 4th round (#25 overall) by the Montreal Alouettes in the 2011 Canadian Football League draft. He played for the Alouettes in 2011 and the Saskatchewan Roughriders in 2012, but he has not played in the CFL since then. Scoop: Barksdale was a backup right offensive tackle as a true freshman in 2007 and played in every game that year, some on special teams. After that he became the starter at right tackle for the 2008 and 2009 seasons and flipped to the left side in 2010, running his streak of consecutive starts to 39 over his final three seasons. As a senior in 2010, he was named Second Team All-SEC. He was chosen in the 3rd round (#92 overall) by the Oakland Raiders in the 2011 NFL Draft, but the Raiders released him before his second year. The St. Louis Rams picked him up prior to the 2012 season and he has started ten games for them over the past couple years. Scoop: As a true freshman in 2007, Brent made 8 tackles, 2 tackles for loss, and .5 sacks as a backup defensive tackle. He became a part-time starter in 2008 and made 34 tackles, 8.5 tackles for loss, 1.5 sacks, and 1 fumble recovery. Then as a junior in 2009, he tallied 29 tackles, 7 tackles for loss, 3 sacks, 3 forced fumbles, and 1 fumble recovery as a full-time starter. Brent was declared academically ineligible for the 2010 season, which caused him to enter the NFL's supplemental draft, where he was taken in the 7th round by the Dallas Cowboys. He made 44 tackles, 1.5 sacks, and 1 forced fumble for the Cowboys before getting into some serious legal trouble in 2012 when he got drunk and flipped his car with teammate Jerry Brown in the passenger seat. Brown was killed in the accident. The accident and Brent's treatment afterward caused quite a stir, and he "retired" after failing multiple drug tests while awaiting trial. In January 2014 he was convicted of manslaughter, for which he was sentenced to 180 days in jail and 10 years of probation. Scoop: Celotto was a backup as a true freshman and made 16 tackles and 4.5 tackles for loss in 2007, including 4 stops in the Ducks' win over Michigan that year. As a sophomore in 2008, he made 10 tackles and 1 tackle for loss. Slowed by injuries, Celotto left Oregon before the 2009 season and ended up at Humboldt State University. He made 1 tackle in 2011 in an injury-shortened season and received a sixth year of eligibility for 2012. As a sixth year senior, he made 14 tackles, 5 tackles for loss, 2 sacks, 2 pass breakups, and 1 blocked kick but could only participate in six games. He went undrafted in the 2013 NFL Draft and appears to have completed his football career. Scoop: Harris redshirted as a freshman in 2007. In 2008 he was a backup defensive tackle and blocking tight end, making 1 tackle in limited time before missing several late games for academic reasons. As a redshirt sophomore in 2009, he became a key backup and made 14 tackles, 2 tackles for loss, and .5 sacks. He finally became a starter in 2010 and finished the year with 35 tackles, 5.5 tackles for loss, 3.5 sacks, 1 interception, 1 forced fumble, 1 fumble recovery, and 1 pass breakup. Then as a fifth year senior in 2011, he had 22 tackles, 7 tackles for loss, 1.5 sacks, 1 fumble recovery, and 6 pass deflections. He went undrafted in the 2012 NFL Draft and has played for the Tennessee Titans and Washington Redskins, last appearing in 2012 for the Titans and making 3 tackles total. He is not currently on an NFL roster. Scoop: Melancon signed with Tennessee out of high school but failed to qualify academically. He then enrolled at Louisiana Tech, where he took a redshirt for the 2007 season and also sat out 2008 due to academic ineligibility. He got into some off-the-field trouble in the off-season and was dismissed by then head coach Derek Dooley. Melancon transferred to Texas Southern, playing nine games in 2009 and five more in 2010. In that 2009 season, he made 31 tackles, 11 tackles for loss, 2 sacks, and 1 interception that he returned 26 yards for a touchdown. Then in 2010 he made 6 tackles, 2 tackles for loss, 1 sack, and 1 forced fumble. He went undrafted in the 2011 NFL Draft and his career appears to be finished. Recruiting defensive tackles is always an iffy proposition, because some players have lots of size and some natural quickness but don't have the technique to be successful. It's also tough for any player to carry that much bulk and stay injury-free. When 300+ pounders are diving at your legs and you're 300 lbs. yourself, you never know what can happen. This class had a mish-mash of talent, and looking through the whole list of defensive tackles from the 2007 class, it didn't seem to have a ton of depth. Sagesse turned into a decent player and may have been more if not for some shoddy defensive coordinating, although defensive line coach Bruce Tall did okay with what he had. Biggest miss: Joseph Barksdale. This one is obvious. Barksdale attended Cass Tech - before it became a pipeline to Michigan - and was right in Michigan's back yard, but they couldn't reel him in. He started off as a defensive tackle at LSU but almost immediately switched to offense, which worked out well for him. Even if he had made the same move at Michigan, the Wolverines could have used him on the offensive line during that stretch of time. Biggest bust: Josh Brent. Brent had a decent college career and the beginnings of a promising NFL run, but the college portion was cut short by bad grades and the pro portion was cut short by terrible life decisions. And by the way, 180 days of jail is way too short for someone who chooses to drink and drive, resulting in a death. Best in class: I would like to say Nick Fairley, but he's a moron, too. I can't bust on Josh Brent and then say Nick Fairley was a real gem. Let me just say that I was angry when the Detroit Lions drafted Fairley #13 overall, and I still am. I guess I'll have to go with Devon Still, the former Penn State defensive tackle who was drafted by the Cincinnati Bengals. Still hasn't done much in the NFL (21 tackles, .5 sacks), but he was the Big Ten's Defensive Player of the Year and an All-American in 2011, earning himself a 2nd round pick. Kudos to Courtney Avery for being honored by the National Football Foundation for his all-around achievements. I remember when he was recruited that his high school coach talked about him in glowing terms, such as he's the type of guy you would want to marry your daughter. Hit the jump for Korean actress Oh In-Hye and her jaw-dropping dress. Black attended Cincinnati (OH) Wyoming and originally committed to Indiana, where his older brother Larry was a defensive tackle. But Jibreel earned lots of offers after committing to the Hoosiers and finally settled on Michigan in January of 2010, selecting the Wolverines over offers from Cincinnati, Michigan State, Purdue, West Virginia, and Wisconsin, among others. He was a 3-star and the #26 strongside defensive end in the 2010 class. Black entered school during Rich Rodriguez and Greg Robinson's final year in Ann Arbor, earning some playing time at defensive end immediately. He played in all thirteen games and made 7 tackles. He was a backup weakside end in 2011, making 18 tackles, 1.5 tackles for loss, and 1.5 sacks. As a junior in 2012, Black became an undersized defensive tackle and made 20 tackles, 5 tackles for loss, 3 sacks, 2 pass breakups, and 1 forced fumble as a part-time starter. As the full-time starter at 3-tech defensive tackle in 2013, he finished his career by making 27 tackles, 7.5 tackles for loss, 2.5 sacks, and 1 forced fumble. Black came in with a middling amount of hype and no clear position. He didn't seem quick enough for weakside end, he was a little short to be an ideal strongside end, and he was undersized to play defensive tackle. In some packages as a senior in 2013, he played nose tackle, which meant that he played all four defensive line positions during his career as a Wolverine. When his body settled in, he was an undersized defensive tackle hovering around 280 lbs. His quickness was difficult to handle for opposing interior linemen, but his lack of bulk was a weakness for the front seven at times. Black had a solid career for a complementary player, but the lack of a star on the interior exposed Michigan to some run deficiencies during his last couple seasons.
. . . his stop near the end of the 2011 game against Ohio State. Black hemmed in fleet-footed OSU quarterback Braxton Miller and recorded half a sack to help seal the 40-34 victory against the Buckeyes. Black was not invited to the NFL Combine. He did 29 reps of 225 lbs. on the bench press during Michigan's pro day in March, but that probably won't be enough to get him drafted. He was a solid but unspectacular starter in college. I could see him forging a career in the Arena Football League, but that's probably as far as he could go. Michael Bird of Braves and Birds explains why the current system of college football scholarships is unsatisfactory. Hit the jump for Gabriela Cevallos. Reisterstown (MD) Franklin offensive guard Patrick Allen was offered by Michigan. Allen is a 6'5", 270 lb. prospect with offers from Arkansas, Florida, Florida State, LSU, Ohio State, and Wisconsin, among many others. He's a 247 Composite 4-star, the #27 offensive tackle, and #236 overall. Allen is a long, athletic kid who I think could play tackle or guard at the next level. He looks like a very good prospect, and I wouldn't be surprised if he moves up in the rankings. Montverde (FL) Montverde Academy offensive tackle Abdul Bello was offered by Michigan. He's a 6'6", 295 lb. prospect with offers from Alabama, Auburn, Florida, Florida State, LSU, and Miami, among others. He's a 247 Composite 4-star, the #19 offensive tackle, and #204 overall. Bello plays a little high, but he moves extremely well for his size. Florida is the supposed leader here. New Lenox (IL) Providence Catholic wide receiver Miles Boykin was offered by Michigan. He's a 6'4", 212 lb. prospect with offers from Florida, Illinois, Michigan State, Notre Dame, and Ohio State, among others. He's a 247 Composite 4-star, the #23 wide receiver, and #185 overall. Boykin visited Michigan for the spring game on April 5th and picked up an offer this past week. Michigan's coaching staff has told him that they want to use him like Devin Funchess, but it might depend on how his body fills out. Boykin is a good athlete for his size, but he is not particularly explosive so he will need to be a possession receiver who gets his yards after the catch by overpowering tacklers. The Funchess comparison is apt. Woodbridge (VA) C.D. Hylton offensive guard Matt Burrell was offered by Michigan. He's a 6'5", 290 lb. prospect with offers from Alabama, Auburn, Florida, Florida State, Georgia, Notre Dame, Ohio State, Oklahoma State, Penn State, South Carolina, Texas, Virginia Tech, and Wisconsin, among others. 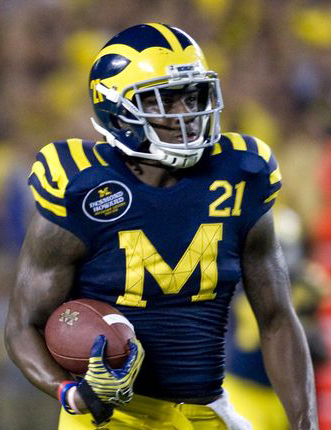 Burrell visited Michigan in September 2013 for the game against Notre Dame and came away raving about his visit, but the Wolverines held off on offering. He and Manassas (VA) Stonewall Jackson defensive tackle Tim Settle, who also holds a Michigan offer, have been talked about as a package deal, but Burrell seems more attainable than Settle. Burrell is a nasty blocker, but while some sites list him as a tackle, he looks more like a guard to me. Bradenton (FL) IMG Academy quarterback Deondre Francois was offered by Michigan. There's actually been some debate about whether an offer was extended or not, but some recruiting sites are still reporting an offer, so I'm leaving him on the board. Offensive coordinator and quarterbacks coach Doug Nussmeier did watch him throw at his school last week, and there's at least some level of interest there. Francois is a 6'1", 190 lb. prospect with offers from Central Florida, Florida, Florida State, Miami, Ohio State, Oregon, and South Florida, among others. He's a 247 Composite 4-star, the #9 dual-threat quarterback, and #249 overall. Francois attended Olympia High School in Orlando last year but has transferred to IMG Academy to get him ready for college. Francois reportedly has some accuracy issues, but he has a cannon for an arm, he looks pretty polished as a thrower, and he's a good runner with a 4.6 forty. As a junior in 2013, Francois completed 104/213 passes (48.9%) for 1,373 yards, 19 touchdowns, and 8 interceptions. Augusta (GA) Christian offensive tackle Zach Giella was offered by Michigan. He's a 6'6", 300 lb. prospect with offers from Clemson, Duke, Kentucky, Miami, and Wisconsin, among others. He's a 247 Composite 3-star, the #74 offensive tackle, and the #666 (yikes!) player overall. Giella has the thick lower body and relative stiffness of an offensive guard, so that's where I would project him at the next level. It's tough to pull kids out of the south, and Giella appears destined to stay below the Mason-Dixon Line. Jacksonville (FL) Bishop Kenny offensive guard Tyler Jordan was offered by Michigan. He's a 6'4", 280 lb. prospect who committed to Florida in February; he also has offers from Georgia, Miami, Nebraska, Ohio State, Penn State, South Carolina, and Stanford, among others. He's a 247 Composite 3-star, the #3 center, and #381 overall. Jordan plays left tackle in high school, but the Gators plan to use him as a center; he looks like an interior guy to me. Tampa (FL) Sickles running back Ray-Ray McCloud III was offered by Michigan. He's a 5'9", 175 lb. prospect with offers from Arizona, Clemson, Florida, Florida State, Miami, Notre Dame, Ohio State, Oregon, UCLA, and Wisconsin, among others. As a junior in 2013, he had 300 carries for 2,316 yards and 26 touchdowns, plus 11 catches for 173 yards and 1 score. McCloud is a speedy, shifty back who would probably have a fair number of his scores called back for taunting if he were playing college football. Florida looks like the leader right now. Greenbelt (MD) Eleanor Roosevelt offensive tackle Isaiah Prince was offered by Michigan. Prince is a 6'6", 275 lb. prospect with offers from Auburn, Florida, Maryland, Ohio State, and Penn State, among others. He's a 247 Composite 4-star, the #11 offensive tackle, and #114 overall. (In case you're wondering, I can find no evidence of relation to 2014 offensive tackle Damian Prince, who is also from Maryland and signed with the Terrapins.) Prince broke his leg and missed much of the 2013 season, but the potential is obviously there if he can remain healthy. Flower Mound (TX) Marcus offensive tackle Keaton Sutherland was offered by Michigan. He's a 6'5", 280 lb. prospect with offers from Arkansas, Baylor, Clemson, Oklahoma, Ole Miss, Texas, and Texas A&M, among others. He's a 247 Composite 4-star, the #30 offensive tackle, and #256 overall. Unger could play guard or tackle at the next level. Both of his parents are Michigan natives, so he has connections to the area, but he has mentioned reservations about playing so far away from home. 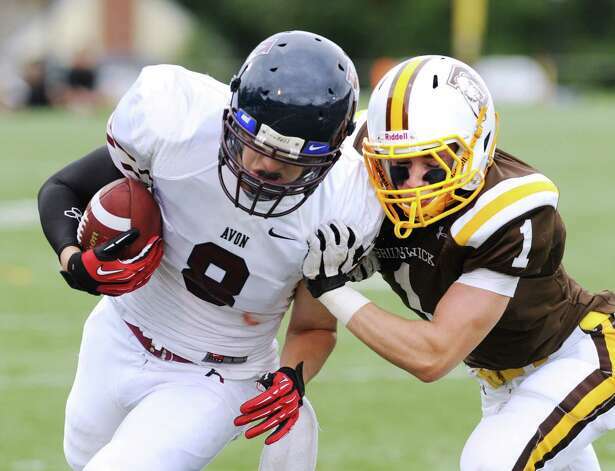 Sutherland attends the alma mater of former Michigan running back Stephen Hopkins, and the Wolverines have also offered teammate Kaden Smith, a 2016 tight end. Sutherland is expected to commit to Arkansas. Jacksonville (FL) First Coast offensive tackle William Sweet was offered by Michigan. He's a 6'5", 270 lb. prospect who committed to North Carolina earlier this month; he also has offers from Auburn, Florida, Florida State, Georgia, LSU, and Miami, among others. He's a 247 Composite 3-star, the #66 offensive tackle, and #583 overall. Sweet stated that he committed to UNC for their academics, which sort of implies that Michigan would be an acceptable school as well. He appears open to the idea of being recruited by other schools. Tampa (FL) Wharton wide receiver Auden Tate was offered by Michigan. He's a 6'4", 195 lb. prospect with offers from Clemson, Kentucky, Miami, Michigan, Ohio State, Penn State, and South Carolina, among others. He's a 247 Composite 3-star, the #47 wide receiver, and #394 overall. As a junior in 2013, he had 49 catches for 815 yards and 5 touchdowns. Tate does not have great speed, but he catches with his hands away from the body and makes some ridiculously acrobatic snags. He's also a good blocker. Tate immediately named Michigan his top school because the Wolverines were his childhood favorite, although Florida State might factor in if they offer. Hopewell (VA) Hopewell defensive end Darrell Taylor was offered by Michigan. He's a 6'4", 220 lb. prospect with offers from Florida, Iowa, Miami, Notre Dame, Virginia, and Virginia Tech, among others. He's a 247 Composite 3-star, the #21 weakside end, and #481 overall. As a junior in 2013, he had 54 tackles, 18 tackles for loss, 10 sacks, 1 interception, 4 forced fumbles, and 3 fumble recoveries. Taylor is a lanky kid who plays some outside linebacker - and made a nice touchdown return on that interception - but he does look like a weakside end at the next level. So far it looks like Virginia Tech will be tough to beat. Orlando (FL) West Orange running back Dexter Williams was offered by Michigan. He's a 6'0", 192 lb. prospect who committed to Miami earlier this month; he also has offers from Florida, Georgia, Notre Dame, Ohio State, South Carolina, Tennessee, USC, and Wisconsin, among others. Williams is a 247 Composite 4-star, the #4 running back, and #64 overall. He claims a 4.54 forty and had 1,072 rushing yards as a junior in 2013. Williams looks like he has good speed and is a slasher. Despite being committed to the Hurricanes, he is open to visiting other schools. 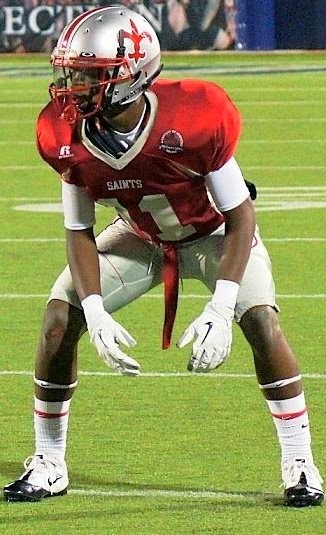 Hampton (GA) Lovejoy wide receiver Preston Williams was offered by Michigan. He's a 6'4", 190 lb. prospect with offers from Alabama, Auburn, Clemson, Florida, Florida State, Georgia, Ohio State, and Texas A&M, among others; he committed to Tennessee back in September of 2013. He's a 247 Composite 4-star, the #6 wideout, and the #44 player overall. As a junior in 2013, he had 59 receptions for 1,388 yards and 14 touchdowns. As you might expect from someone averaging about 23 yards/catch, Williams has excellent speed, coordination, and change of direction. Hit the jump for additions to the 2016 Offer Board, commitments to other schools, and miscellaneous news bits. Nick Baumgardner answers some mailbag questions about Michigan football. Hit the jump for some pictures of C.J. Miles. Fourth and Long by John U. Bacon. 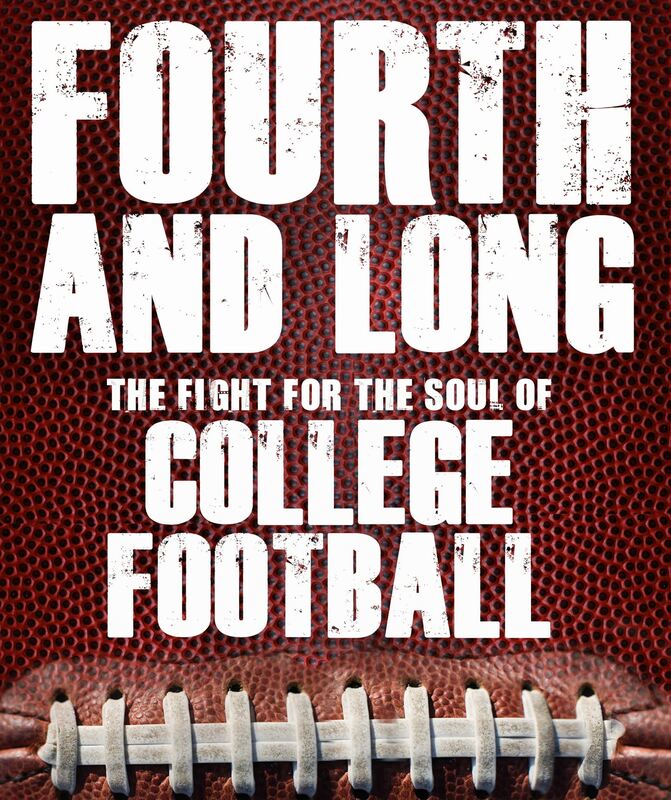 I finally got around to reading Bacon's latest book, which follows Michigan, Northwestern, Ohio State, and mostly Penn State during their recent seasons. The book is mainly centered on PSU's tumultuous 2012 season in the aftermath of the Jerry Sandusky allegations, Joe Paterno's death, the NCAA sanctions, and Bill O'Brien's hiring. Bacon, a University of Michigan alum and former lecturer, also spends quite a bit of time looking at David Brandon's - and the Big Ten's - money grabs in recent years. Scattered throughout are some looks at Northwestern coach Pat Fitzgerald, whom Bacon respects a great deal, and OSU head coach Urban Meyer. The PSU stuff is the most inspiring, because it details coaches and players who were willing to work together toward a common goal. That contrasts with the views of Michigan, where Bacon seems to imply that Brandon has himself and the bottom line in mind more than the traditions at Michigan. It was a pleasurable and quick read, but you can tell that Bacon is trying to avoid stepping on any toes. After all, the last time he did so, the University of Michigan basically cut all ties to him following Three and Out. The lack of quality editing in Fourth and Long is somewhat distracting, what with players and coaches referred to as "Mark Venric" (Northwestern's Venric Mark), "Gordon Melvin" (Wisconsin's Melvin Gordon), and "Ron Vanderlin" (Penn State linebackers coach Ron Vanderlinden), so be prepared. Following the two aforementioned books, Bacon's next piece will be titled Fifth and Short, the story of Tom Brady working his way up from the bottom of the depth chart and Tyrone Butterfield's place in Michigan lore. The Great Gatsby by F. Scott Fitzgerald. I've read this one before, but I decided to pull it out again for old time's sake. There's nothing new to say about the book that hasn't been said numerous times before, but I've always had trouble with how slowly the novel begins. It develops into a very intricate, delicate, and heartwarming love tragedy, but Fitzgerald wasn't really interested in grabbing the reader's attention off the bat. Mystic River by Dennis Lehane. I sort of stumbled into reading this one. I've never been much of one for crime thrillers, but I was in a spot with nothing to read, so I picked up this one and thought I could just leave off whenever I got the chance. But on the way to putting the book down, I discovered I couldn't. I had seen the movie several years ago (starring Sean Penn, Kevin Bacon, and Tim Robbins), but even though I knew the outcome, I wanted to see how the story developed. I thought the character of Dave Boyle (played by Tim Robbins in the movie) was extremely interesting. Dave, who had been kidnapped and molested at ten years old, still feels the effects of the crimes against him years into his adulthood - as a father, as a husband, as a friend. To me, the murder of Jimmy Marcus's daughter became an afterthought. I rarely say this about fiction novels, but this one has heart. You can't help feeling some pity for the characters involved. Shutter Island by Dennis Lehane. I cannot extol the virtues of this movie enough, but the book paled in comparison. The reverse was true for Mystic River (still a good movie, though). In case you're unfamiliar, the story follows Detective Teddy Daniels as he investigates the escape of an inmate from Shutter Island, a facility housing violent and mentally unstable criminals. Expounding on the plot might reveal too much, but if you have to choose, rent the film. Directed by Martin Scorsese, the acting and casting choices (Leonardo DiCaprio, Mark Ruffalo, Ben Kingsley, Max Van Sydow, Emily Mortimer, Jackie Earle Haley, Elias Koteas, etc.) are impeccable. A Dance with Dragons by George R.R. Martin. After reading this, the fifth volume in A Song of Ice and Fire, I felt like I was left with more questions than answers. Perhaps it's because the sixth book hasn't been released yet, but when I closed the book, I wanted more. With the other books, I knew all I had to do for more information was crack open the next novel, but I can't do that here. I appreciated that this book concentrated on some of my favorite characters (Tyrion Lannister, Jon Snow, Daenerys Targaryen) and mostly left out some of my least favorites (Brienne of Tarth, Jaime Lannister, Arya Stark), but I'm prepared for the sixth to bring them back into the fold. A Feast for Crows by George R.R. Martin. This is the fourth book in Martin's series. I'm leaving my mind open to the idea that the future novels might intertwine these story lines better, but the forays into Dorne and the Iron Islands seemed out of place to me. Obviously, Martin was able to connect them in some fashion, but they seem like filler at this point. I can safely say that A Feast for Crows is my least favorite of the five novels so far, but it didn't stop me (nor should it stop you) from marching onward with the fifth book. Damned by Chuck Palahniuk. I typically like Palahniuk. One of these days, I will probably devote an entire post to my feelings on his various novels. But I have been disappointed with most of his recent efforts, including this one; I have tried and failed many times to suffer through Pygmy. In the style of Are You There, God? It's Me, Margaret by Judy Blume, Damned tells the story of Maddy Spencer, a 13-year-old girl who dies of a marijuana overdose while her famous mom and dad are attending the Oscars. The premise is pretty funny (especially in the wake of Mitch McGary's banishment for smoking weed, but I digress), but I just had a tough time getting into this one. There are some good parts, like there are with almost all Palahniuk efforts, but the overall theme gets a little tiresome. I probably would have liked it better as a short story. There is a sequel, though, called Doomed, which I have yet to start. Feel free to leave responses or reading suggestions in the comments or on the Book Suggestions page! Michigan sophomore basketball player Mitch McGary was essentially forced into leaving for the NBA after he tested positive for marijuana during the NCAA Tournament. This leaves Michigan woefully thin in the frontcourt after redshirt junior Jon Horford announced he would transfer. The Wolverines are stuck with Max Bielfeldt, who appears to be a career backup-level player; redshirt freshman Mark Donnal; and incoming freshman Ricky Doyle. Hit the jump for some pictures of Brittany Oldehoff, which might dull the pain a little bit. Darian Roseboro - DE - Lincolnton (NC) Lincolnton: Roseboro is a 6'4", 265 lb. prospect with offers from Alabama, Auburn, Clemson, Florida, Georgia, Michigan, North Carolina State, Ohio State, Texas, Virginia, Virginia Tech, and numerous others. He's a 247 Composite 4-star, the #8 strongside end, and the #110 player overall for the 2015 class. If his stats are to be believed, he has had quite a three-year run since his freshman year when he had 107 tackles, 12 tackles for loss, and 7 sacks. He followed that up with 107 tackles, 30 tackles for loss, and 8 sacks as a sophomore and then 121 tackles, 21 tackles for loss, and 11 sacks as a junior. Ace recruiter Roy Manning, who has taken over the mid-Atlantic area for Michigan, has been developing a good relationship with Roseboro and secured a four-day trip to Ann Arbor this week. MLive: Can Michigan's defense carry a young offense? Nick Baumgardner discusses whether defensive coordinator Greg Mattison and the defense can get Michigan some wins early until the offense comes around. Hit the jump for Danielle Knudson. Start enjoying your weekend with some pictures of attractive women! I sure am glad Aaron Hernandez didn't accept his scholarship offer to play for Michigan. Scoop: Watson redshirted as a freshman in 2007, then played some on special teams in 2008. As a redshirt sophomore in 2009, Watson moved to linebacker and made 5 tackles, 1 tackle for loss, and 1 pass breakup in limited action. He became a defensive end and even saw some action at defensive tackle in 2010, notching 3 total tackles. With a dearth of tight ends on the team, Watson moved back to offense in 2011 and started four games; he made just 1 catch in his career, but he made it count because it was a 9-yard touchdown against Northwestern. He was not drafted in the 2012 NFL Draft and his football career appears to be finished. Scoop: Webb played sparingly as a freshman in 2007, mostly as a special teamer but also as a backup tight end. As a sophomore in 2008, Webb mostly sat on the bench behind Carson Butler and Kevin Koger and played in just three games. Still behind Koger in 2009, Webb started just one game but saw more time at tight end and caught 4 passes for 44 yards and 1 touchdown. He started two more games as a senior in 2010 and caught 5 passes for 67 yards and 1 touchdown. Webb went undrafted in the 2011 NFL Draft and has never played in the league, but he has bounced around between the Eagles, Jets, Buccaneers, Cardinals, Colts, Titans, Lions, and now the Indianapolis Colts. Scoop: Watson played defensive end to start at Iowa, making 15 tackles, 4 tackles for loss, and 2.5 sacks as a freshman backup in 2007. He became a starter in 2008 and made 40 tackles, 3.5 tackles for loss, and 1.5 sacks, 1 pass breakup, and 1 forced fumble. Ballard grew into a starting defensive tackle by his junior year and had a very good season with 54 tackles, 9 tackles for loss, and 5.5 sacks; he was named Honorable Mention All-Big Ten. As a senior in 2010, he played both defensive end and defensive tackle and made 43 tackles, 5 tackles for loss, 3 sacks, 3 pass breakups, and 1 forced fumble, once again earning Honorable Mention All-Big Ten. He was drafted in the 4th round (#106 overall) of the 2011 NFL Draft by the Minnesota Vikings after testing positive for marijuana, which caused his draft stock to fall a little bit. He made two total starts in 2011-2012 for the Vikings and totaled 29 tackles and 1 sack. However, he quit football prior to the 2013 season due to a lack of love for the game. Scoop: Hernandez started three games as a freshman in 2007, including the Outback Bowl against Michigan; he caught 9 passes for 151 yards and 2 touchdowns that year. He became the starter at tight end as a sophomore and caught 34 passes for 381 yards and 5 touchdowns. 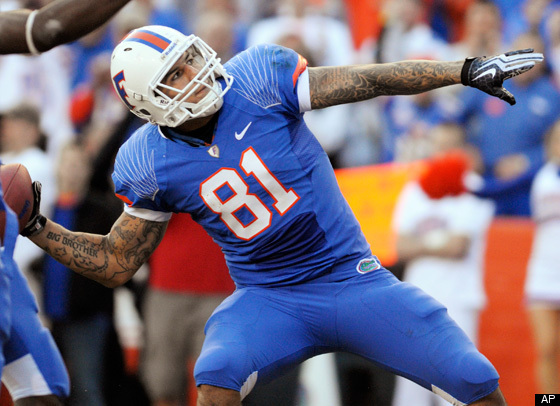 As a junior in 2009, Hernandez won the John Mackey Award (given to the nation's best tight end) with 68 receptions for 850 yards and 5 touchdowns; naturally, he was First Team All-SEC and a First Team All-American. Hernandez left college after his junior year only to drop to the 4th round (#113 overall) of the 2010 NFL Draft, chosen by the New England Patriots. He made the Pro Bowl in 2011 and totaled 175 catches for 1,956 yards and 18 touchdowns from 2010-2012. He also saw some action as a situational running back, running 9 times for 97 yards in his career. However, Hernandez was allegedly involved in a murder and was arrested during the summer of 2013, for which he is still matriculating through the legal process. It's safe to assume that his football career is over for the foreseeable future, if not permanently. Scoop: Irby made 2 catches for 29 yards as a freshman in 2007. As a sophomore in 2008, he caught 10 passes for 95 yards and 2 touchdowns, but he suffered a gruesome knee injury in a game against Rice. He sat out the 2009 and 2010 seasons rehabbing from the injury, which tore his right ACL and MCL and caused nerve damage. Irby returned in 2011 to catch 11 passes for 157 yards and 3 touchdowns. Rather than pursuing a sixth year of eligibility or attempting to make a career out of football, he chose to retire following the 2011 season. Michigan actually seems to have done quite a good job of identifying talent at the tight end position in the 2007 class. Ballard made a big impact (at a different position), Hernandez turned into arguably the best tight end in college, and Irby seemed well on his way to a good career, if not for the knee injury. Webb has bounced around NFL practice squads and was somewhat hampered by his situation, where he spent his last three years under a coach who didn't use tight ends very much. Watson, the least accomplished of the bunch, still turned into a mediocre starter and was likely stunted in his development by the Rich Rodriguez offense and bouncing to defense. If he had played tight end his whole career for a coach who valued tight ends more (such as the guy who recruited him, Lloyd Carr, or the guy for whom he finished his career, Brady Hoke). Biggest miss: Christian Ballard. I suppose the choice here based on talent would be Aaron Hernandez, but his repeated run-ins with the law, failed drug tests, etc. would be a huge black mark on the program. Even if Ballard never played a down at tight end and played defense instead, he turned into a quality player who was NFL-bound. Biggest bust: Aaron Hernandez. Hernandez had all kinds of talent and could have been one of the most productive tight ends in NFL history, although he might have been limited by Rich Rodriguez's offense. He was probably better off at Florida than he would have been elsewhere, so he made the right choice. Unfortunately, that appears to have been one of the few good choices he has made in his life. I'm glad to say that Michigan has no real connection to him, but it's a sad story overall. Best in class: Rob Gronkowski. Gronkowski, who went to Arizona, caught 28 passes for 525 yards and 6 touchdowns as a true freshman in 2007 and followed that up with 47 receptions for 672 yards and 10 touchdowns as a sophomore. He missed the 2009 season after having back surgery, but his first two seasons were good enough to earn him a 2nd round selection (#42 overall) by the New England Patriots in the 2010 NFL Draft. Despite suffering from various injuries at the pro level, he has caught 226 passes for 3,255 yards and 42 touchdowns during his four-year career and made the Pro Bowl twice. 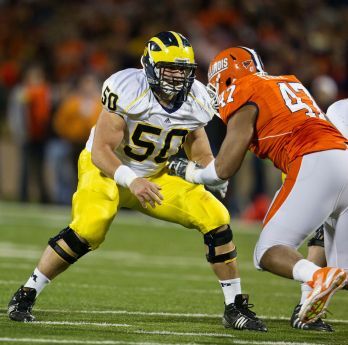 MLive: Taylor Lewan could be #2 pick, according to Mel Kiper, Jr. This varies from what I've seen elsewhere, but Kiper says Lewan could go as high as #2 but shouldn't drop past #6 in the NFL Draft. Hit the jump for former Playmate Nikki Leigh. Glanda attended Bloomfield Hills (MI) Brother Rice and was All-Catholic League in football as a senior, but perhaps more impressively for an eventual 6'3", 256-pounder, he was an all-state hockey goalie as a senior at Brother Rice. Glanda walked on to the program under Rich Rodriguez but redshirted that first year. (If you're wondering whether he bulked up significantly after being a swimmer and hockey player in high school, he was listed at 265 lbs. his freshman year.) As a redshirt freshman in 2010, Glanda saw action in one game while he sat behind starting snapper Tom Pomarico. When Brady Hoke arrived in 2011, he made Glanda the short snapper (for field goals and extra points) while Pomarico held onto the long snapper job (punts). Glanda's moment in the sun came in the Sugar Bowl at the end of the 2011 season when a fake field goal pass by Drew Dileo was deflected and fell into the hands of Glanda, who was tackled after an 11-yard gain. Coming back to Earth, Glanda spent 2012 and 2013 as the team's long and short snapper, handling all the snapping duties with Pomarico having graduated. Glanda made a highlight reel catch in the Sugar Bowl against Virginia Tech, but the best thing I can say about Glanda is that I don't remember a single errant snap during his four years on the field. Long snappers are guys you rarely notice unless they screw up, and they might get their names called a couple times a season when they make tackles on punt coverage. 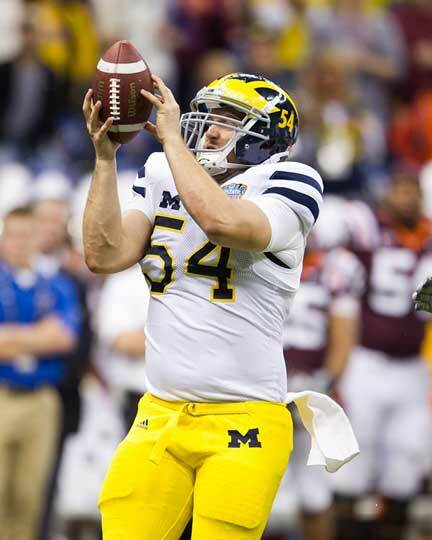 With Michigan losing Glanda and holder Drew Dileo in the same off-season, it will be strange and perhaps a bit unnerving to watch their replacements in 2014 and beyond.
. . . that one extra point snap against Illinois in 2012. Remember? Yeah, me either. It's the catch against Virginia Tech, obviously. Long snappers can make a living in the NFL, but it's somewhat of a crapshoot who makes it. I'm sure pro talent evaluators have some things they look for, but they're very much under the radar. I can't imagine anyone having a much better portfolio than Glanda has, but we'll have to see. I don't believe a long snapper has ever been drafted solely to snap (although occasionally snappers double as backup tight ends or linebackers), so if Glanda catches on at the next level, it will have to be as a free agent. Michigan offensive lineman Graham Glasgow will be arraigned on May 19th for an OWI. Hit the jump for Michelle Lewin in a bikini. Scoop: Huyge redshirted as a freshman in 2007. Huyge didn't play at all during the 2008 season, but he turned into a nine game starter (five at guard, four at tackle) as a redshirt sophomore. He started another seven games at tackle in 2010 and became the full-time starter at right tackle as a fifth year senior in 2011. He was not drafted in the 2012 NFL Draft and his football career appears to be finished. Scoop: Molk redshirted as a freshman in 2007 but became a full-time starter in 2008 and never looked back. He started four games as a redshirt sophomore in 2009 but was sidelined by foot and knee injuries. As a redshirt junior in 2010, he was First Team All-Big Ten, a Rimington Trophy finalist, and the team's top lineman after starting all thirteen games. During his fifth year season in 2011, he won the Rimington Trophy and was a First Team All-American. He was drafted in the 7th round (#226 overall) by the San Diego Chargers. He played in twelve games for the Chargers but was released prior to the 2013 season. The Philadelphia Eagles signed him earlier this offseason. Scoop: Bulaga started five games as a freshman in 2007 and was named Freshman All-Big Ten. As a sophomore in 2008, he became the full-time starter at left guard and was named Second Team All-Big Ten. He missed a few games in 2009 but was still named first team all-conference and a First Team All-America. He left Iowa after his true junior year and became a 1st round pick (#23 overall) by the Green Bay Packers in the 2010 NFL Draft. He has been a starter at both right and left tackle in the NFL and was an All-Rookie player in 2011, but he missed the 2013 season due to a torn ACL. Scoop: Burkes started two games as a true freshman in 2007 and four more as a sophomore in 2008, but his career ended before the 2009 season when a medical condition was discovered. Scoop: Crump redshirted in 2007 and had some minor knee issues during the spring of 2008, but then he quit football prior to the 2008 season. Scoop: Elliott - who is no relation to former Michigan and NFL tackle Jumbo Elliott - redshirted as a freshman in 2007. From what I can gather, he did not continue his football career beyond that season. Scoop: Jackson redshirted as a freshman in 2007. He left Illinois for DuPage Junior College in 2008 and then transferred to Glenville State, where he started at left tackle for three consecutive seasons and was named All-WVIAC each year. He was not drafted by the NFL and now plays for the Spokane Shock of the Arena Football League (along with former Michigan defensive tackle Terrance Taylor). Scoop: Oglesby redshirted as a freshman in 2007 before starting three, ten, and two games in the successive seasons, missing portions of each with knee problems. He finally stayed healthy and blossomed as a fifth year senior in 2011 when he started thirteen games and was named First Team All-Big Ten. He went undrafted in the 2012 NFL Draft and was signed by the Washington Redskins, but his knee problems forced him to fail his physicals and his career ended. He spent 2013 as a graduate assistant at Wisconsin. Scoop: Maurkice's twin brother, Mike played defensive tackle as a freshman in 2007 due to some injuries on the team, making 8 tackles and 1 interception. As a sophomore in 2008, he started all fourteen games at offensive guard and was named Second Team All-SEC. He became a Second Team All-American as a junior in 2009. Then as a senior in 2010, he moved to center (replacing his brother, who went to the NFL) and became Second Team All-SEC. He was drafted in the 1st round (#15 overall) by the Miami Dolphins in the 2011 NFL Draft. He has started 46 games for the Dolphins from 2011-2013 and was named to the Pro Bowl in 2013. Scoop: Ramsey started ten games as a true freshman in 2007 and was named to the SEC All-Freshman team, also earning Honorable Mention Freshman All-America. Ramsey injured his back prior to the 2008 season, which ended his career; that injury instigated a lawsuit against Auburn's athletic trainer, whom Ramsey blamed for the permanent injury during his rehab. Scoop: Romine played sparingly as a freshman in 2007, which garnered him a redshirt, and then was a backup for the next two years. As a redshirt junior in 2010, he made three starts in the middle of the year. He was a grad year transfer to Tulsa in 2011 and started all thirteen games that season. He was not drafted in the 2012 NFL Draft and was not picked up by a pro team, as far as I can tell. Scoop: Sawtelle redshirted at Tennessee in 2007 and did not see game action in 2008. When Lane Kiffin was hired at Tennessee, he and Sawtelle didn't see eye to eye, so Sawtelle transferred to Grand Valley State in 2009. He played ten games that season but appears to have left the team prior to 2010. Scoop: Schwartz redshirted in 2007 but immediately drew into the lineup as a redshirt freshman, starting the next 51 games of his career at Cal. He was Second Team All-Pac 10 as a redshirt junior in 2010 and moved up to First Team as a fifth year senior in 2011. He was a 2nd round pick (#37 overall) by the Cleveland Browns in the 2012 NFL Draft. He has started all 32 games of his pro career. Scoop: Sherrod was a backup as a freshman in 2007 but became a starter for the 2008-2010 seasons, getting the nod at left tackle in his final 36 games. He was First Team All-SEC as a senior in 2010. He was a 1st round pick (#32 overall) by the Green Bay Packers in the 2011 NFL Draft. He has played in just twelve games during his three-year NFL career, partly due to a broken leg that robbed him of part of 2011 and all of 2012. Scoop: Stephenson redshirted as a freshman in 2007 before playing in seven games as a backup in 2008. He missed the 2009 season, partially due to injury, but returned to start ten games in 2010 and total 103 knockdown blocks, which was second on Oklahoma's line. As a fifth year senior in 2011, he was Honorable Mention All-Big 12. He was drafted in the 3rd round (#74 overall) by the Kansas City Chiefs in the 2012 NFL Draft, and he has started 14 games over the last two seasons. Scoop: Wisniewski played in eight games and started one as a true freshman in 2007, earning him Freshman All-Big Ten honors. He became a full-time starter at right guard for the 2008 season. Moving from guard to center for his junior year in 2009, Wisniewski was named First Team All-Big Ten. Not only did he maintain that status a year later, but he added First Team All-America in 2010. He was selected in the 2nd round (#45 overall) by the Oakland Raiders in the 2011 NFL Draft and has started all 45 games he has played since entering the league, both at guard and center. Scoop: Ziemba started thirteen games as a true freshman in 2007 and was named a Freshman All-America, and he started twelve more games as a sophomore. With thirteen starts as a junior in 2009, he was named Second Team All-SEC. As a senior in 2010, he was an All-American and First Team All-SEC after starting all fourteen games, and the SEC coaches gave him the Jacobs Blocking Trophy, which is awarded to the conference's best blocker. Overall, he started 52 games for Auburn. He was drafted in the 7th round (#244 overall) by the Indianapolis Colts in the 2011 NFL Draft and played six games for them in 2011, but he has not played since then. Biggest miss: Mike Pouncey. This is a difficult choice because Michigan recruited several good players. I could probably choose Maurkice Pouncey, Stefen Wisniewski, or Bryan Bulaga here, too. However, Michigan got a good center in Molk, so Maurkice Pouncey would have been a luxury, although he could have played guard next to Molk. Wisniewski, too, could have been a guard for Michigan. But Mike Pouncey had success at both guard and center, and while I thought Michigan was able to piece together some quality tackle play over the years, the interior of the line seemed a little more questionable. If you plug in Mike Pouncey at right or left guard during the Rodriguez years, I think that would have helped quite a bit. Biggest bust: John Elliott. I can find no record of injury or family strife for Elliott, who it appears quit football entirely. Either way, he was the #16 offensive tackle in the country and appears not to have played a single down of college football. Best in class: Maurkice Pouncey. Really, there are lots of options, as several guys turned into high level draft picks and solid NFL players. Pouncey, though, won the Rimington Trophy, became the #18 pick as a center (which is very high to pick a center), and was a Pro Bowler for his first few years in the league, stopped only by a torn ACL at the beginning of 2013. As opposed to what Hoke said about the team chemistry in 2013, Nick Baumgardner reports that Michigan's head coach likes the chemistry of the 2014 team. Hit the jump for Elena Petrova's abs. Nick Baumgardner talks about Michigan's exploration of transfer players to help shore up some weaknesses for the upcoming season. Hit the jump for Svetlana Bilyalova, who is ridiculously good looking. Kaplan (LA) Kaplan defensive end Jalen Bates was offered by Michigan. He's a 6'5", 240 lb. prospect with offers from Louisiana Tech, Louisiana-Lafayette, Ole Miss, TCU, and Texas Tech. He's a 247 Composite 4-star, the #12 weakside end, and #340 overall. He's very raw and needs to work on his stance, footwork, hand use, just about everything - but he does have some physical talent. Bates is the cousin of former Michigan linebacker Jonas Mouton. Bellevue (WA) Bellevue offensive tackle Henry Roberts was offered by Michigan. He's a 6'6", 263 lb. prospect with offers from Oklahoma, Oregon, Stanford, USC, Washington, and Wisconsin, among others. He's a 247 Composite 4-star, the #29 offensive tackle, and #236 overall. Roberts is a lanky kid who obviously needs to put on weight, but there's not a lot of film on him. Bellevue is one of the top programs in the state of Washington and produces quite a bit of talent for the Pacific Northwest, and former Michigan offensive lineman Stephen Schilling came from there. Sicklerville (NJ) Timber Creek wide receiver Cameron Chambers was offered by Michigan. He's a 6'3", 195 lb. prospect with offers from Arkansas, Ohio State, Pitt, Rutgers, Wisconsin, and West Virginia, among others. 247 Sports, which released its 2016 rankings last week, placed him as a 4-star, the #14 wide receiver, and the #83 player overall for his class. He does not quite look 6'3" in his highlights, although he may have hit a growth spurt this offseason; however, he shows some good straight line speed and claims a 4.59 forty. Tampa (FL) Catholic wide receiver Nate Craig was offered by Michigan. He's a 6'2", 195 lb. prospect with offers from Auburn, Clemson, Florida, Miami, Ohio State, and Tennessee, among others. He's a 247 Sports 4-star, the #18 wide receiver, and #92 overall. Personally, I would rate Craig ahead of Chambers because he looks superior in almost every category. Fort Lauderdale (FL) St. Thomas Aquinas cornerback Rashard Causey committed to Florida Atlantic. Causey has offers from Florida, Miami, Notre Dame, South Carolina, and UCLA, along with lots of others, so I don't quite understand this one. I know little about Causey because he didn't show much interest in his Michigan offer, but this is a commitment I would watch down the road for a change of heart. Jersey City (NJ) St. Peter's Prep cornerback Minkah Fitzpatrick committed to Alabama. I wrote a scouting report on him back in February. I mentioned three teams with the best chance to get him, and the Crimson Tide was one of them (with Michigan and Ohio State the others, although South Carolina was also lurking). Michigan held off on offering for a while, which may have hurt their chances, but it's tough to believe they could have pulled ahead of the Tide. Bradenton (FL) IMG Academy cornerback Marcus Lewis committed to Florida. Lewis recently transferred from Washington (DC) Gonzaga Prep, which signaled to me a desire to play down south. Not long after that was announced, he committed to the Gators. Lewis could play corner or safety at the next level. Over at Recruiting Season last week, I profiled Clarkston's Cole Chewins, Mount Pleasant's Kalebb Perry, Detroit Country Day's Justin Hunter, St. Joseph's Wes French, and Chandler Park Academy's Jalen Martin. This piece by Nick Baumgardner reveals that Hoke noticed some chemistry issues last season, which has been discussed but not acknowledged by the coaching staff up to this point, as far as I recall. Hit the jump for some pictures of Demi Rose Mawby, a brunette whom I've seen scattered across the internet but had remained anonymous to me until recently. Chris Clark - TE - Avon (CT) Old Farms: Clark is a 6'6", 247 lb. prospect who recently decommitted from North Carolina; he also has offers from Michigan, Notre Dame, and Ohio State, along with many others. He's a 247 Composite 4-star, the #3 tight end, and #130 overall. As a junior in 2013, he caught 39 passes for 417 yards and 6 touchdowns. Recruiting gurus are picking Notre Dame, where he visited a couple weekends ago, but he has yet to visit Columbus or Ann Arbor. Clelin Ferrell - DE - Richmond (VA) Benedictine: Ferrell is a 6'5", 225 lb. prospect who recently named a top eleven of Clemson, LSU, Miami, Michigan, Michigan State, North Carolina, Ohio State, Ole Miss, South Carolina, Tennessee, and Virginia Tech. He's a 247 Composite 4-star, the #8 weakside end, and #84 overall for the class. He plays in the same league as freshman QB Wilton Speight and 2014 cornerback commit Garrett Taylor, and his teammate is 2016 wide receiver offeree Scott Bracey. 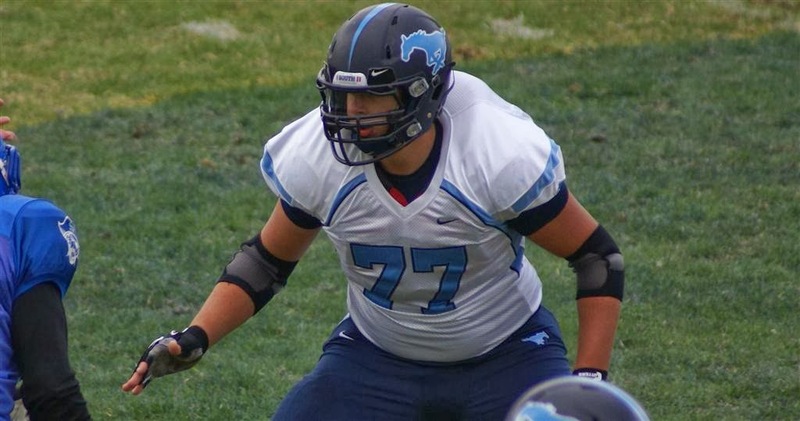 Grant Newsome - OT - Lawrenceville (NJ) Lawrenceville School: I typed up a scouting report on Newsome at the end of March. He recently picked up an Arkansas offer and visited Penn State. Ben Bredeson - OT - Hartland (WI) Arrowhead: Bredeson is a 6'5", 275 lb. prospect with offers from Iowa State, Michigan, Tennessee, and Wisconsin. He visited Michigan for the spring game a couple weekends ago and also took a swing through Columbus and Knoxville. The Badgers are considered to be the leader. Brady Hoke, as you might expect, has had nothing but good things to say about new offensive coordinator Doug Nussmeier. Hit the jump for Ana Cheri in a sports bra, and other assorted items. It will be very interesting to see how the Jabrill Peppers situation plays itself out, but there are some other battles going on, too. Nick Baumgardner highlights some of them. Hit the jump for Suelyn Medeiros and her backside. Start enjoying your weekend with a few pictures of some lookers and a Kate Upton gif. Nick Baumgardner put together a piece that highlights Brady Hoke's confidence in his team. Do you agree? Hit the jump for Kelly Karloff wearing at least a bit of clothing. 247 Sports released its top 247 players for the class of 2016. Normally, I just list the offered players, but since this is so early for a class of 2016 list, I'll also be listing players with connections to Michigan and/or from the Big Ten imprint that Michigan normally recruits. Offered players are denoted by an asterisk, and the only Michigan offeree not on the list is Georgia offensive lineman E.J. Price. Michigan commit Erik Swenson starts off at #233 on the list. Athlon got done with their rankings of all the coaches nationally, and Michigan's very own Brady Hoke came in at #38. Of course, a lot of this comes down to team performance, so it ignores outside factors. So take it with a grain of salt. One good season could vault him ahead of several of those coaches and put him back in the upper echelon. Hit the jump for Katee Owen, including a GIF that will bring you joy. ESPN released its updated top 300 players for the class of 2015. Here's what it looked like back in November. - Garrett Taylor appears at #106. He did not have an offer in November, so I'm not sure where he was ranked. Scoop: Babb redshirted in 2007 and bounced back and forth between receiver and cornerback. As a redshirt sophomore in 2008, he caught 2 passes for 45 yards. He reportedly had verbal altercations with Michigan's coaches and was released from his scholarship. To my knowledge, he did not continue his football career elsewhere. Scoop: Clemons burned a redshirt for 1 catch and 5 yards a freshman in 2007. With the arrival of Rich Rodriguez for the 2008 season, Clemons moved to slot receiver due to little or no depth behind freshman Martavious Odoms. He caught 11 passes for 101 yards as a sophomore in 2008, but transferred to Colorado after the season. He used that redshirt to sit out the 2009 season due to NCAA transfer rules. As a redshirt junior in 2010, Clemons caught 43 passes for 482 yards and 3 TDs; he also rushed the ball 3 times for 17 yards. Then as a fifth year senior in 2012, he caught 43 passes for 680 yards and 8 touchdowns. He was drafted in the 7th round of the 2012 NFL Draft by the Pittsburgh Steelers but was cut and ended up catching 3 passes for 43 yards for the Jacksonville Jaguars that season. He spent time with the Carolina Panthers and San Diego Chargers in 2013. Scoop: Hemingway caught 4 passes for 37 yards as a freshman in 2007, when both he and Clemons burned redshirts. As a sophomore in Rich Rodriguez's first year, Hemingway was expected to be a starter; however, after catching 2 passes for 41 yards and 1 touchdown, including a 33-yard score against Utah, he developed mononucleosis and missed the remainder of the year. He returned as a redshirt sophomore in 2009 to catch 16 passes for 268 yards and 2 touchdowns. As a redshirt junior in 2010, he was Denard Robinson's favorite target on the outside and caught 32 passes for 593 yards and 4 touchdowns. He followed that up with another solid season in 2011 and totaled 34 catches for 699 yards and 4 scores, finishing with a 20.6 yards/catch average. He was picked in the 7th round (#268 overall) by the Kansas City Chiefs in the 2012 NFL Draft and has 13 catches, 125 yards, and 2 touchdowns as a pro. Scoop: Ditto was a jumbo high school receiver who played tight end for a bit before switching to linebacker. He left Penn State prior to the 2009 season but did not resume his career elsewhere. Scoop: Johnson was a backup wideout as a freshman and grabbed 7 passes for 110 yards and 1 touchdown, and he was the primary kick returner with 25 returns and a 24.8 yards/return average. As a sophomore in 2008, he started a couple games and finished with 33 catches, 570 yards, and 8 touchdowns, plus a 27.1 yards/return average on 14 kickoffs. Johnson missed part of the 2009 season with an injury but finished with 34 catches for 378 yards and 3 touchdowns. In his 2010 senior season, Johnson caught 64 passes for 692 yards and 8 touchdowns, and he became the team's punt returner with 22 returns, 312 yards, 14.1 yards/return, and 1 touchdown. He was drafted in the 6th round (#182 overall) by the San Francisco 49ers in the 2011 NFL Draft and has been on the rosters of the 49ers and Philadelphia Eagles, but he has never played a game. Scoop: Jones contributed early in Knoxville, catching 11 passes for 111 yards and 1 touchdown, along with 8 rushes for 58 yards and 2 touchdowns. As a sophomore in 2008, he had 30 catches for 323 yards and 4 touchdowns, plus 23 carries for 126 yards and 1 score. His explosiveness peaked in 2009 with 46 receptions for 680 yards and 4 touchdowns, and he capped his career with 55 catches for 596 yards and 4 more scores. He was also an occasional kick and punt returner for the Volunteers, but his biggest accomplishment was leading the team in receptions for three consecutive seasons (2008-2010). He was not drafted in the 2011 NFL Draft and signed with the Philadelphia Eagles for a short time but never played. He also stirred up a little controversy when he allegedly gave some advice to a high school recruit to go to Auburn instead of Tennessee. Jones's football career appears to be finished. Scoop: Little played running back, wide receiver, and returner during his time in Chapel Hill. As a freshman in 2007, he ran 59 times for 300 yards and 2 touchdowns while catching 13 passes for 99 yards and 1 score. In 2008 those number improved to 78 carries for 339 yards and 3 scores, plus 11 catches for 146 yards. During his 2009 junior season, he became more of a receiver and ended with 62 catches for 724 yards 5 touchdowns, but he still ran 29 times for 166 yards and 1 touchdown. He was suspended for his senior season in 2010 due to the academic/illegal benefits scandal at UNC, but he still managed to be selected in the 2nd round (#59 overall) by the Cleveland Browns in the 2011 NFL Draft. In three seasons with the Browns, he has totaled 155 catches for 1,821 yards and 8 touchdowns. Scoop: Mason went to North Carolina and was a hybrid receiver/tight end, but he barely played and was suspended indefinitely for undisclosed reasons. After the 2009 season, he transferred to Georgetown College in Kentucky and had 20 catches for 340 yards and 5 touchdowns as a fifth year senior in 2011. He went undrafted in the 2012 NFL Draft and appears to have concluded his football career. Scoop: Maze originally committed to Michigan but ended up signing with Alabama. He redshirted as a freshman and had 11 catches for 137 yards and 2 touchdowns as a redshirt freshman in 2008. Maze became a starter in 2009 and finished just behind Julio Jones in several categories with 31 catches, 523 yards, and 2 touchdowns. As a redshirt junior in 2010, Maze caught 38 passes for 557 yards and 3 touchdowns. He was targeted more frequently as a fifth year player in 2011 when he caught 56 passes for 627 yards and 1 touchdown. Maze was also a solid punt returner who had 54 punt returns for 703 yards and 1 touchdown between 2010 and 2011. He earned Second Team All-SEC honors in 2011, and you may remember him pulling his hamstring on a punt return against LSU in the BCS Championship game against LSU. He went undrafted in the 2012 NFL Draft and was cut by the Steelers after signing as an undrafted free agent. Scoop: Paul played sparingly as a freshman in 2007, notching just 1 catch for 6 yards. He became a part-time starter in 2008 and grabbed 23 passes for 214 yards. As a junior in 2009, he broke out with 40 receptions for 796 yards and 4 touchdowns, all of which earned him Second Team all-conference honors. He finished up his career with 39 receptions for 516 yards and 1 touchdown in 2010. Paul was also a quality returner; he had 60 punt returns for 647 yards and 1 touchdown, and he had 77 kickoff returns for 1,887 yards and 2 touchdowns. He was selected in the 5th round (#155 overall) by the Washington Redskins in the 2011 NFL Draft. As mostly an H-back type for the Redskins, he has amassed 14 catches for 228 yards and 1 touchdown in three seasons. Scoop: Simas redshirted as a freshman in 2007 and was declared academically ineligible to play in 2008, but he still managed to win the program's Scout Team Player of the Year. During his first year of seeing the field in 2009, he managed to catch 43 passes for 585 yards and 3 touchdowns. Unfortunately, he got charged with a DUI in 2010, failed to show up to court, and got kicked off the team. There was some noise about him transferring to San Diego State, but that appears not to have materialized and his football career seems to have ended. Scoop: Washington played sparingly as a freshman in 2007 and caught 3 passes for 46 yards and 1 touchdown. He was limited mostly to special teams in 2008 and contributed 1 tackle. Washington sat out the 2009 season. As a redshirt junior in 2010, he caught 5 passes for 61 yards. He went undrafted in the 2011 NFL Draft but popped up in the Arena League in 2012, when he played for both the Milwaukee Mustangs and the Orlando Predators, totaling 40 receptions for 485 yards and 6 touchdowns. His career appears to be finished. Biggest miss: Marquis Maze. This is a tough choice because none of the guys Michigan offered really turned into stars, so I see it more as an issue of "fit." Any of these guys would have played the majority of their careers for Rich Rodriguez, and Maze would have been a solid slot receiver for Rodriguez, and possibly a punt returner, too. Michigan got decent production from its slot guys (Martavious Odoms, Kelvin Grady, Roy Roundtree, etc. ), but Maze was pretty consistent and could have played on the outside once Brady Hoke was hired. Biggest bust: Markques Simas. This is close between Simas and Taurian Washington, but Washington got opportunities to get on the field and just never did much. Meanwhile, Simas clearly had talent and did well as a redshirt sophomore, but he just couldn't stay out of trouble. Considering the guy who vaguely took his place (Toney Clemons) got drafted and has bounced around the league, Simas could be earning a paycheck in the NFL right now. Best in class: Titus Young. Just kidding! He's a head case. Dez Bryant was a 4-star wideout and the #54 player in the nation coming out of Lufkin (TX) Lufkin. He picked Oklahoma State over Arkansas, Louisville, Oklahoma, Texas A&M, Texas Tech, and others. Okay, he's a head case, too, but he has the talent to back it up. As a sophomore in Stillman, he caught 87 passes for 1,480 yards and 19 touchdowns and was named an All-America in 2008. Some eligibility issues caught up to him to end his career prematurely, but he was the #24 overall pick in the 2010 NFL Draft and has 293 catches, 4104 yards, and 40 touchdowns in his four-year pro career.